ETD recently completed a project on Failure Investigation and Root Cause Analysis (RCA) of a Gas Turbine for a Middle Eastern Power Plant. The client urgently decided to replace the damaged GT compressor parts. During disassembly of the GT compressor casing, further, similar damage was observed at other compressor rotor stages and to the stator vanes. ETD were requested to provide a quotation to perform complete Failure Investigation and Root Cause Analysis (RCA) for the above damaged parts, which have been removed from a Gas Turbine. Applying appropriate tools and methodologies to determine the root cause of the failures/ damages. Detailed analysis and discussion of the failure investigation & RCA findings. Conclusions and recommendations based on the findings of the above investigation. A report of the RCA study results to include recommendations for any mitigating actions to be taken by the plant operator for continued operation of their GTs. For more information about ETD’s Failure Analysis services, please click here. 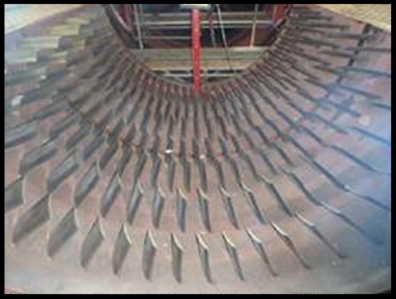 ETD recently completed a project on Investigation of Pitting Damage to Compressor Vanes of 13E2 Gas Turbines. Particle samples collected from the GT compressor inlet. A report on the investigation of pitting damage, including (i) analysis of the risk of continuing to run the GT with the observed level of pitting damage on the vanes, and (ii) recommendations for remedial actions that may be possible to avoid or minimize the risk of pitting damage to the GT units. For more information on ETD’s Failure Analysis services, please click here. Launch of a New Group Sponsored Project by ETD "Reliability Issues with Gas Turbines Operating in Baseload and/ or Cycling Modes"
To read the GSP Outline please click on the Proposal Image. ETD has launched a new proposal for a Group Sponsored Project. The proposal is entitled ‘Reliability Issues with Gas Turbines Operating in Baseload and/ or Cycling Modes’. The overall objective of this project is to ‘identify issues with the operation of open (or simple) cycle and combined cycle combustion turbines and provide information, methodologies and guidance on ways to address reliability and performance problems’. ETD will therefore perform a detailed evaluation of the technical factors and issues that impact the performance of a range of combustion turbine models, including impacts of a range of operating conditions both for base load and cyclic operation. ETD has a good background in this as it has carried out similar work for its clients in North America and Europe. As this is a Group Sponsored Project (GSP) costs are shared between a number of sponsors so each pays only a fraction of the total project cost. Launch of a New Group Sponsored Project by ETD "Protection & Preservation of Compressors in Gas Turbines"
ETD has launched a new proposal for a Group Sponsored Project. The proposal is titled ‘Protection and Preservation of Industrial Gas Turbine Compressors’. This study is intended to provide operators of Industrial Gas Turbines (IGTs) with information to improve their inspection and maintenance planning in relation to the IGT compressor, and to enhance the economics of plant operation. This will allow them to target improvements and optimize expenditure on related aspects of their plant Operations and Maintenance. Such optimization can potentially save plant operators $millions, in terms of improved output and thermal efficiency, as explained in the proposal. This idea comes from the problems faced by some ETD clients, who have experienced damage and degradation of their IGT compressor.